Solana Beach students are learning how to live healthier lives, thanks to the Sage Garden Project. The charitable foundation recently awarded more than $350,000 to California schools, including a $10,700 donation to Skyline Elementary School and a $10,000 donation to Solana Vista Elementary School, for garden and nutritional science programs. 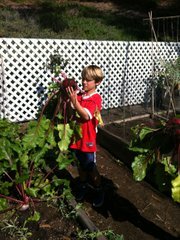 Based in Encinitas, the Sage Garden Project offers hands-on gardening and nutritional science programs for students in kindergarten through sixth grade. As one program of The Anthony Cerami and Ann Dunne Foundation for World Health, the Sage Garden Project aims to reduce obesity and Type 2 diabetes in youth by providing the tools and inspiration for a lifetime of health.